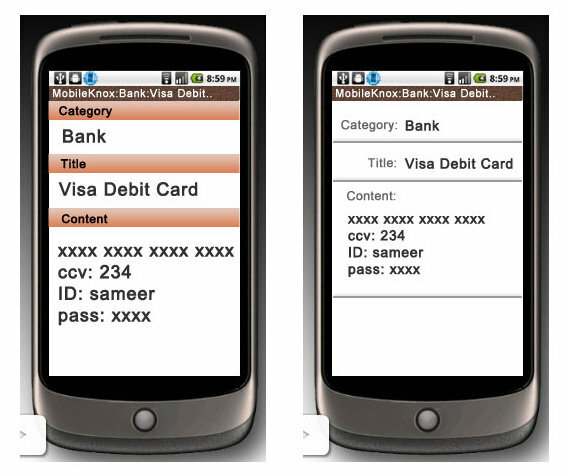 Firstly, DesktopKnox provides keywords which can be used to easily enter data that is needed repeatetly. For instance, mail addresses are often used as user names so entering a mail address with two clicks is much faster than typing a mail adress with a keyboard. 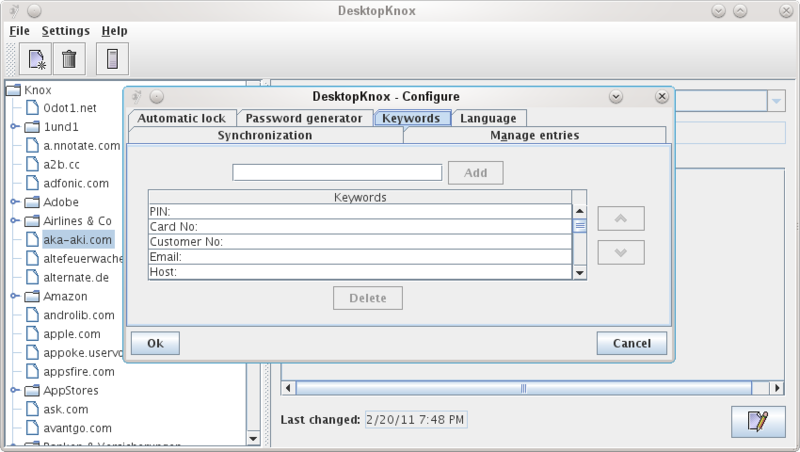 DesktopKnox offers a slick and easy-to-use interface to manage keywords in the settings. This keywords are now synchronized with MobileKnox so that you have your keywords with you. Especially, if you create an entry with your smart-phone or tablet it is handy if you can enter keywords with two clicks. 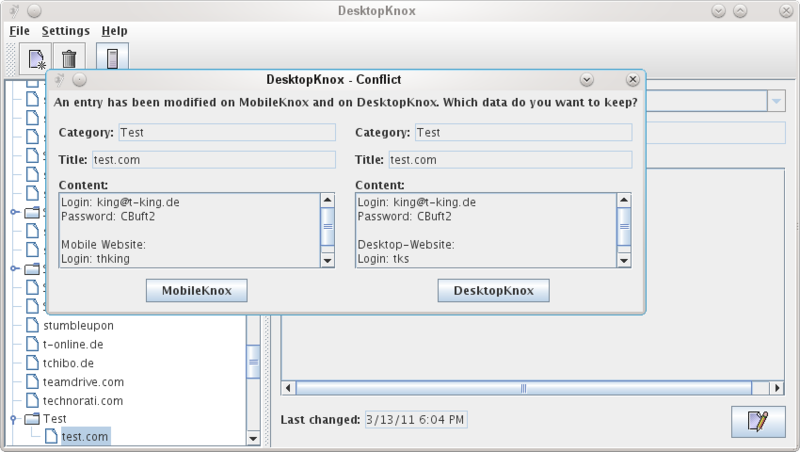 Secondly, if you change an entry on DesktopKnox and MobileKnox before you synchronize a conflict happens. The screen that asks you about how to resolve the conflict now shows the category of both entries in addition to the title and content. This makes conflict resolution even easier. Additionally, a few bugfixes have been applied to make MobileKnox and DesktopKnox even better. From time to time I receive mails from customers stating what they love and hate about MobileKnox and DesktopKnox. I really like these mails as they give me feedback on what is good and also bad about MobileKnox and DesktopKnox. The good thing is that most customers are more than happy with my software. However, nearly all of these mails contain suggestions how MobileKnox could be improved in one way or the other. A few days ago I received a mail from a customer who did not only suggest how MobileKnox should be improved. Instead, he also scribbled a sketch how such an improvement could look like. After discussing the matter for some time with this customer I realized that he might be right. Before I start changing the colors and font sizes I would like to get more user feedback on this. What do you think about the current theme? What do you think should be changed? Which colors do you prefer? Does the structuring of the screens need an overhaul? Your feedback is highly appreciated. Please feel free to comment about anything you think of! Today I released MobileKnox 1.9.1 just days after MobileKnox 1.9.0. The changes between 1.9.0 and 1.9.1 are exclusively user interface improvements. What do you think about the small but impressive changes? Is it now easier to enter the master password and hit the “ok” button? Does the lock screen look better? Let us know! As usual you will find the latest version of MobileKnox in the app store of you choice!